For Drew Lawson, there isn't anyone else as undeniably off-limits as the addictively sweet, mind-wreckingly beautiful Skylar Sullivan. Hell, she's the very definition of the girl-next-door do-gooder. And while he is officially classified as a white hat hacker by the suit-wearing folks who keep track of that sort of thing, no one would ever say that hat of his is exactly pristine. So when Skylar's arrival at his doorstep on the roughest night of the year for him every year leads to a downright memorable hotel mishap, an impromptu winter road trip, and the discovery of a secret that could change how she sees him forever, Drew is convinced the universe is on some kind of convoluted mission to thaw his cold, jaded heart. ...Because, lordy, they've certainly sent in a ringer to get the job done right. Before That Promise is a quick & emotional, short & sweet crossover holiday novella starring two of my favorite secondary characters -- Skylar Sullivan from my Can't Resist series, all grown up, and Drew Lawson from my Cactus Creek series, as swoonworthy as ever (no worries, you don't have to have read either of those series). There's a HFN (happily-for-now) ending, with the second book in this duet (Every Promise Unspoken) picking up a few years down the line for this utterly meant to be couple. NOTE: Book Two will be released after Violet's medical prognosis improves (she's been on medical leave since January 2017 receiving aggressive new treatments and surgeries for multiple failing organs). We're hopeful that these treatments take and she'll be able to return to work by Spring 2018. Updates will be available on her website and social media pages. His arms became full-body shackles around her when the thought of her being hurt slammed into him. Skylar released a surprised mini-yelp, and then quickly tried to reassure him, "Drew, I'm fine. Nothing happened to me." Where once he'd thought the neverending possessiveness he felt about her was his most primal fate, Drew now discovered his protectiveness over her far eclipsed it. "Don't ever do anything so recklessly romantic like that again. Not for me or anyone. I'd never forgive myself if anything had happened to you. And I sure as hell would've made certain no living soul would ever be able to forgive the man who harmed you." Eyes glued to his, her breathing faltered at whatever she saw in its depths. "Wh-what happened to your due north?" Drew slid his hands up to cup both sides of her face. "I'm looking at it. Don't ever doubt that where my moral compass is concerned, you're my due north. More than I realized. More and more every day, it seems." Strange how this was the first time he was admitting out loud that he often pictured Skylar in his future, and yet it didn't sound at all foreign coming out of his mouth. Her gaze fell to his lips as he uttered that declaration and it took every last bit of restraint in his body to keep himself from kissing her. Because he knew that once he did, he'd never be able to let her go again. This is part one of a two part series telling Drew and Skylar's story. In this part Skylar is 18 to Drew's 21. Skylar has been in love with Drew forever but Drew has put her in the off limits zone until she's 21. On her way home for the holidays Skylar makes an unexpected stop in Vegas and ends up on Drew's doorstep. The attraction between these two is off the charts but he's determined to make sure nothing will happen between them for another 3 years so they come up with a plan..... This is a very well done story and I can't wait to read how everything turns out. I recommend this one. Whenever I pick up a Violet Duke book it is like enjoying time with an old quirky friend that always makes you laugh. Do note that this novella ends in a cliffhanger and the second part will be released Valentine's 2017. If you are looking for a quick, light read, with all the good feelings of Christmas, I'd put this book at the top of my list. -Spoilers below- At first I wondered if the main man, Drew, was going to be "alpa" enough for a my taste in romance novels, but I enjoyed getting to know his soft side first. And, there is a hallway scene that is absolutely steamy, while still managing to be innocent. This section of the novella alone gets five stars! I submitted a request to the publisher to read and voluntarily review an uncorrected advance reader's copy of this book. Oh my!!! What a beautiful beginning!!! I love the setup of Drew and Skylar's story and I am so looking forward to reading the rest of their story. Sky and Drew are so very different. She not only loves Christmas, she completely believes in the magic of the season. Whereas Drew can't even bring himself to say the words Merry Christmas, he so completely doesn't believe. I just know that the rest of this story will be just as fantastic as every other book I have read by this author!!!! 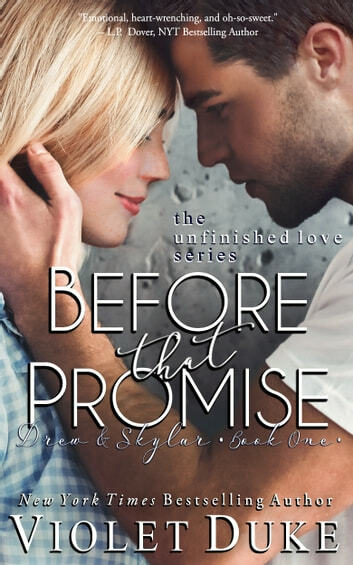 Before that Promise is the first book in the duet of books about Drew and Skylar. If you have read Violet Duke's other series, you might recognize Skylar Sullivan from the Can't Resist series and Drew Lawson from the Cactus Creek series and if you haven't read either, that won't matter either because this duet will stand alone! Drew is not a fan of Christmas or anything that has to do with the merry holiday. What he is a fan of is Skylar, but he's also stated that until she turns 21, she's off limits to him. She's everything he could ever want, but until he deems her old enough, he's vowed to stay away. Skylar is all too aware of Drew's thought process and she's ready to put an end to it. She's close enough to 21 that she thinks it shouldn't matter anymore and when on her way home to her family for Christmas, her flight gets stuck in Las Vegas, Lia, Drew's sister gives her the information she needs to locate him. A lot happens for Drew and Skylar in his novella, including a road trip where they both open up and share parts of them that they haven't before, especially Drew. It's obvious that they are it for one another, but the question remains will they be able to actually get together and make it work? I greatly enjoyed this first part of the duet and while I voluntarily read an Advanced Reader’s Copy of the book, I purchased it and would encourage anyone else to do so as well. It's a great addition to Violet Duke's stable of work and I can't wait for the next one to come out! Drew and Skylar is the couple that everyone who reads Violet Duke's books have been waiting for! Well we finally got a little taste of I submitted a request to the publisher to read and voluntarily review an uncorrected advance reader's copy of this book. to come. The book gives a little detail about what Drews plan to findhis brother is. This is a very sweet book that gives you teasers to what the conclusion of their story will be like. I submitted a request to the publisher to read and voluntarily review an uncorrected advance reader's copy of this book. This is an honest review of my opinion of the book.